Isn’t it annoying when you’ve taken utmost care of your hands, moisturising them and giving them pretty manicures, only to find them ruined by dry, cracked cuticles surrounding the nails? We would well do without their dry, neglected appearance, and the little darts of pain that go with them. It is out of the question to leave them to their own devices, so to reduce them down to nothing, we propose this home made oil that will help you keep your cuticles soft and beautiful. Here is how to prepare it. 1) Add the essential oils to the roll-on container. 2) Add the vitamin E oil to the mix. You can use a pipette to measure it out. 3) Fill the flask up with the coconut oil. 4) Close the roll-on tightly and shake it. You need to shake it before each use. The more diligent among you may want to apply it regularly, so you need to check first with a patch test that you don’t have any allergic reactions to it, as this treatment contains a high concentration of essential oils (15%). 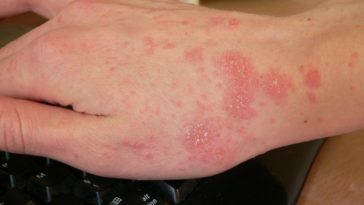 Massage it into the area for treatment and don’t hesitate to apply a little hand cream afterwards. You can massage it into your cuticles once a week, leaving it on for one minute and then pushing back the softened cuticles with a cuticle pusher.